"Thank you, Miss Bankhead, sir..."
In my liner notes for the first three collections of "The Big Show", I discussed the many elements that make the show a delight to listen to: a high budget, top stars, a roster of experienced writing talents, rare dramatic performances, and so on. But prime among these elements is the inclusion of musician-composer Meredith Willson as the program's presiding maestro, complete with a 44-piece orchestra and 16-voice chorus, and also as stooge-sidekick to the mistress of ceremonies, "the glamorous, unpredictable" Tallulah Bankhead. 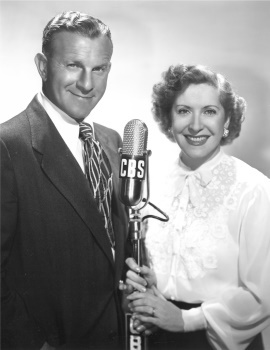 It was a role with which Willson was most comfortable throughout his radio career, bringing meticulous comedic timing to his trademark "chiffon swing" musical arrangements and a characterization that had been used in series prior to "The Big Show's" debut -- most notably George Burns and Gracie Allen's Thursday night comedy program for Maxwell House Coffee. Robert Meredith Reiniger was born on May 18, 1902 in Mason City, Iowa -- a town he frequently mentioned during his on-the-air appearances and a hamlet that would play a most extraordinary role in the defining moment of his entertainment career. (More on that later.) He attended what we now call the Julliard School in New York City, and later achieved fame as a flute and piccolo player with the John Philip Sousa band and the New York Philharmonic Orchestra under the direction of Arturo Toscanini. 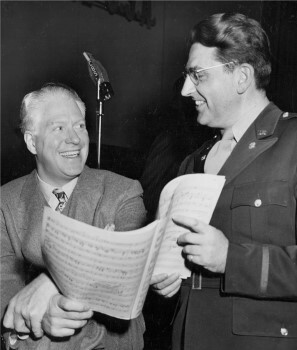 In 1929, Meredith moved to San Francisco to become the concert director for station KFRC, where he was a regular on the popular "Blue Monday Jamboree," and later became musical director of the NBC Radio network in Hollywood. His early radio career began with appearances on series like "Carefree Carnival" and "The Maxwell House Show Boat," and it was the latter broadcast that served as his introduction to what would become a longtime association with sponsor General Foods. He was tabbed by the company to be the musical director of their successful "Good News" program, an hour-long extravaganza that could be called a precursor to "The Big Show," and stayed on when the show was, in 1940, shortened to thirty minutes and became "Maxwell House Coffee Time" and featured stars Frank Morgan and Fanny Brice as "Baby Snooks". He left the series after four years to fulfill a military obligation, which found him working for the Armed Forces Radio Service. With the debut of "The Big Show" in 1950, Willson generated big laughs on the ninety-minute superstar broadcast by humorlessly referring to his boss Talloo as "sir" and often prattling on at great length about his Mason City childhood. During his "Big Show" stint, however, Meredith was hard at work at turning his Mason City experiences into a stage musical - one that he later described as "an Iowan's attempt to pay tribute to his home state." Eight years and thirty revisions later, it premiered on Broadway in 1957 as "The Music Man," and became one of the landmark stage musicals of all time. The tunes - Trouble, Seventy-Six Trombones, 'Til There Was You - were all composed by Willson, who wrote forty songs for the show in all. (A "Big Show" broadcast from January 14, 1951, available in our earlier Volume 3, includes an embryonic version of a "Music Man" perennial, there titled "'Til I Met You," performed by Fran Warren.) Practically every song from "The Music Man" is permanently etched in the history of popular music; indeed, the prolific Willson made many contributions to this arena, including "The Big Show's" signature sign-off, "May the Good Lord Bless and Keep You," and the modern-day Christmas classic "It's Beginning to Look a Lot Like Christmas." With the success of "The Music Man," Willson made the leap into musical theatre and never really looked back; his follow-ups include "The Unsinkable Molly Brown" and "Here's Love," a musical version of the film "Miracle on 34th Street." But upon the demise of "The Big Show," Willson found time for one more radio series: a variety program entitled "Encore" featuring operatic moments and musical stage highlights and starring Marguerite Piazza and frequent "Big Show" guest Robert Merrill. Meredith even made inroads into the visual medium, appearing as a panelist on the early TV quiz show "The Name's the Same," concocted from the Mark Goodson-Bill Todman game show factory. 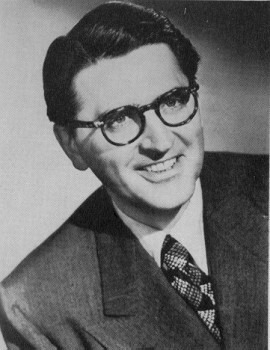 Old-time radio fans have, of course, been long aware of Meredith Willson's incomparable musical contributions to entertainment for years now. Thanks to Radio Archives, Willson reigns supreme in five more sequential ninety-minute broadcasts of "The Big Show" -- newly restored and remastered in this collection. Tallulah welcomes a gathering of both high- and low-brow guests, including Beatrice Lillie, Dennis King (who is featured in a dramatic adaptation of Herman Melville's "Billy Budd"), Jack Carson and Ed Wynn. Ed volunteers once again to interpret Lauritz Melchior's operatic performance (this time it's "Tannhauser"...but it still sounds like "Carmen"). Later in the program, Carson and Fred Allen do the same for Tallulah's rendition of "I'll Be Seeing You." Bing Crosby and Bob Hope are heard on the Chesterfield commercial. The performers are Ed Wynn, Jack Carson, Beatrice Lillie ("Not Wanted on the Voyage"), Dennis King, Lauritz Melchior (Wagner's "Dreams"), Fred Allen, Portland Hoffa, The West Point Choir ("The Corps"), announcer Ben Grauer, Meredith Willson and his Orchestra and Chorus and Tallulah Bankhead. Judy Holliday returns to the program...and she's still needling Tallulah about her love life. Talloo also crosses verbal swords with Monty Woolley and then accompanies him in re-creating his most famous stage/movie role in a scene from the Moss Hart-George S. Kaufman play "The Man Who Came to Dinner." Later in the program, Judy, Jack Haley, and Olsen and Johnson send up the same scene. Uta Hagen and Paul Kelly also perform scenes from Clifford Odetts' "The Country Girl." Bing Crosby and Bob Hope are heard on the Chesterfield commercial. The performers are Jack Haley (who warbles a hilarious tune about all the Irish talent in Hollywood), Uta Hagen, Monty Woolley, Judy Holliday, Ole Olsen and Chic Johnson, Paul Kelly, Robert Merrill (Verdi's "Di Provenza"), announcer Ed Herlihy, Meredith Willson and his Orchestra and Chorus ("Military Polka") and Tallulah Bankhead. This program features an outstanding tribute to the great Irving Berlin -- but before the show-stopping finale, Ethel Merman spars verbally with Talloo, Portland Hoffa sings "Sweet Marie" (with hubby Fred Allen accompanying her on the banjo), and Herb Shriner does one of his classic "Hoosier" routines. Clive Brook, Hugh Riley and Margaret Phillips perform an excerpt from Philip Barry's "Second Threshold," adapted by Robert Sherwood. Bing Crosby and Bob Hope are heard on the Chesterfield commercial. The performers are Clive Brook, Ethel Merman, Frankie Laine ("Swamp Girl"), Fred Allen, Herb Shriner, Hugh Riley, Margaret Philips, Margaret Truman ("Love is Where You Find It"), Portland Hoffa, announcer Ed Herlihy, Meredith Willson and his Orchestra and Chorus ("Aba Dabba Honeymoon") and Tallulah Bankhead. The program features a compendium of comedy veterans: Bob Burns, "The Arkansas Traveler", tells stories from his hometown of Van Buren, Arkansas -- and plays the bazooka to boot; Smith and Dale perform their immortal "Dr. Kronkheit" routine with Jean Courtney as the nurse; and tall tales emanate from Baron Munchausen (Jack Pearl) to the amazement of straight man Cliff Hall ("Vas you dere, Sharlie?"). Jimmy Durante is reunited with vaudeville partner Eddie Jackson (the two men sing "Bill Bailey") and Celeste Helm and Talloo dish the dirt about each other. Bing Crosby and Bob Hope are heard on the Chesterfield commercial. The performers are Billy Eckstine ("If"), Bob Burns, Celeste Holm ("The Happy Ending"), Jimmy Durante, Eddie Jackson, Evelyn Knight ("I Remember the Cornfields"), Jack Pearl, Cliff Hall, Jean Courtney, Joe Smith and Charlie Dale, announcer Ed Herlihy, Meredith Willson and his Orchestra and Chorus ("Thoughts While Strolling") and Tallulah Bankhead. 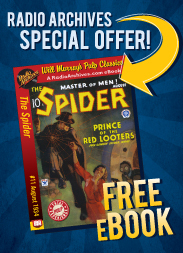 Ethel Waters recreates her celebrated stage role as Hagar in a dramatized scene from "Mamba's Daughters" and Fred Allen tells the sad tale of how a family was ripped apart by the quiz show phenomenon...just before Talloo auditions to appear on Phil Baker's radio show. Bing Crosby and Bob Hope are heard on the Chesterfield commercial. The performers are Phil Baker (who plays "Stardust" on his accordion), Johnny Burke, Eddie Cantor ("Oh! Oh! Oh! There's Nothing Like Radio"), Eddie Fisher ("Bring Back the Thrill"), Ella Fitzgerald ("Sometimes I'm Happy"), Fred Allen, Portland Hoffa, Jan Peerce ("May the Good Lord Bless and Keep You"), Ethel Waters ("Happiness is Just a Thing Called Joe"), Martin Blaine, announcer Ed Herlihy, Meredith Willson and his Orchestra and Chorus ("Here Comes the Springtime") and Tallulah Bankhead.